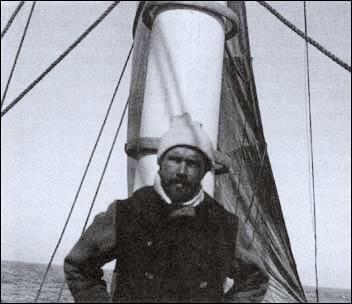 Æneas Mackintosh and the Ross Sea Party | Shackleton. “Æneas Lionel Acton Mackintosh was born on 1 July 1879 in Tirhut, India. He was educated at Bedford Modern School and in 1894, joined the Merchant Navy. “Mackintosh was granted leave to join the British Antarctic Expedition, 1907 – 1909 (leader Ernest Henry Shackleton), as navigator and second officer of Nimrod on her initial voyage to Lyttelton, New Zealand, and later as a member of the shore staff. While unloading stores at McMurdo Sound, he lost his right eye in an accident and returned in Nimrod to New Zealand for medical treatment before rejoining the shore party in January 1908. “After the expedition, Mackintosh was despatched by Shackleton as a member of an unsuccessful gold-mining expedition to the Carpathians and spent three months on the Cocos Islands in the South Pacific in search of Spanish treasure.